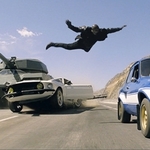 Fast and Furious 6 is a Film programme that first aired in 2013 and has been classified a 12 certificate. Just when you thought it was safe to get out of the car, up pops free wheeling speed demon Dom Toretto (Vin Diesel) and his international crew of heisters for a full-throttle instalment of the franchise that never runs out of road. Having hung up his driving gloves and retreated to the Canary Islands, unstoppable car-jacker Toretto is hauled out of retirement by crook-hunter Hobbs (Dwayne Johnson) when a new upstart crew threatens to wipe out the world's security systems. Moreover, his presumed-dead ex-ride Letty (Michelle Rodriguez) is driving on the wrong side, working for the new bad guys, and there's no way he's going to let that one slide. 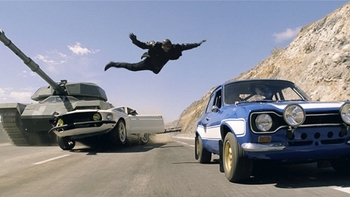 Cue global car carnage as Toretto reassembles old gang Brian (Paul Walker, in one of his final roles), Roman (Tyrese Gibson), Tej (Ludacris), Han (Sung Kang) and smoking hottie Gisele (Gal Gadot) for a pedal-to-the-metal clash that could see them all pardoned... or dead. It may have done a few laps in its time but there's still life in the old Fast and Furious franchise yet as Justin Lin's petrol-head pleaser proves. A simple combination of superhot cars, chicks and chases, the turbo-charged blockbuster will never have the grace of a classic, but who cares when the action sequences and verbal-sparring are this much fun? Also known as "Furious 6"
When is Fast and Furious 6 next on TV?